The eighth hole at the Ha Long Bay course. Hanoi, Vietnam: Award-winning Schmidt-Curley Design has begun construction on another golf course in Vietnam, in the city of Ha Long Bay. It marks the company’s second project for the FLC Group and will bring world-class golf to the destination resort town, considered among Southeast Asia’s prime tourist destinations. The course is uniquely situated high above the town centre on a mountain property that offers epic, sweeping views of Ha Long Bay, a UNESCO World Heritage site known for its towering, vegetated vertical rock formations that rise from the calm blue waters of Ha Long Bay. The course will offer numerous green sites with the stunning backdrop of Ha Long Bay viewed from high above, framed by rock outcrops and mature native vegetation punctuated with pines. The site and its dramatic terrain offers a drastic departure from the sandy dunes of many Vietnamese sites along the coast, including the Schmidt-Curley Design, 10-course project underway in Quang Binh. The creation of world-class golf on difficult terrain is of no concern for the experienced design team that has been responsible for the creation of numerous courses on similarly difficult sites during its many years of work in Asia. These courses include the Mission Hills resort in China where a difficult property was transformed into world-class courses that have hosted some of Asia’s greatest professional championships. 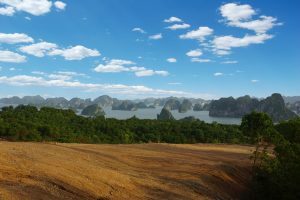 At Ha Long Bay, Schmidt-Curley Design has once again teamed up with Flagstick Golf Construction Management and its President, Martin Moore, another veteran of transforming difficult terrain into stunning designs. Being above a series of ridges, the course will feature dramatic, sweeping views on every hole and strong elevation changes in many cases. Curley said the design team is eager to create a course with unique features, including a wide variety of length, such as a 110-yard par-three overlooking Ha Long Bay. “I grew up in Pebble Beach where the short par-three seventh hole has become a hole recognised around the world. I believe we have the same opportunity here,” said Curley. A long-time member of the Asian Golf Industry Federation, Schmidt-Curley has cemented its presence in Vietnam with the establishment of new offices in Hanoi. “Our past success in China was intrinsically tied to a strong customer service effort with local offices and hands-on attention,” said Curley. The 18-hole Ha Long Bay course is expected to be completed by year’s end and open for play in 2017.